Winter Seasons = 110% safety gear. All of our SUP friends lives in a different climates so we all have different skin sensitivity to cope with the cold weather. I have cold hand issues in the winter since my youth days. Wether skiing on top of Chamonix, France to Mont Blanc, Switzerland or not I always had to fight with my hands to keep stay warm. When you are on land it’s much easier including riding my mountain bike in the 26F temperature with snow on the ground. So one might ask what did you wear for your mountain bike ride in those cold days?. Below 32F/0C I would wear my regular cycling cloth with dirt bike pants as it hardly breath and traps the heat. Tops is whatever I feel like that is not too restricting over my long sleeve cycling jersey. My feet is quite interesting because I use MTB cycling shoes. Wear wool socks and on snow day then I would use grocery bag before step into my fancy shoes. Often times I have used booties as well. My hands, I just wear ski gloves or at least gloves that have enough movement to pull the brake levers. Back to the SUP outfit. In 2016, I became Ocean Rodeo Ambassador and I’m pretty stoked about that. I think most common question every winter we discuss is which one?. I say most popular choices are “Ocean Rodeo” and “Starboard/SUPskin” but most majority of the issues I heard is from the female paddlers with fitment issues. Lisa Schell the editor of Distressed Mullet has great article covered already for you if you haven’t read yet. 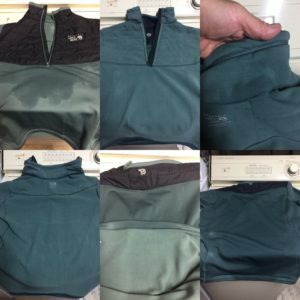 I personally like idea of 100% waterproof with Ocean Rodeo. Not that I have dipped last winter season but it’s just a piece of mind. SUPskin is 99% waterproof and as long as you don’t dip past your neck. Always there is a Pros/Cons and there is no right or wrong answer here. You just need to find the one that works the best for you. This year I opted not replace my drysuit with 2017 model due to minimal changes. I heard zipper around your neck is changed to slightly smaller style zippers and Ocean Rodeo uses TZIP. TZIP been used by many of waterproof products. One of my Northface waterproof larger duffle bag I used few years ago with now my ex-girlfriend on day trip at Green River here in Kentucky uses TZIP as well. Quality of drysuit is well made and all the seams are excellent. Off course properly maintaining your gear is key to prolong your gears. Finally this year Ocean Rodeo got away with black color on model “Heat” to orange color!!. “Orange is the new black” for real !… Sun and black fabric doesn’t work well in any situation but in drysuit that leads to overheating. Cloudy day between 32/0C to 45/7C black Ocean Rodeo Heat did well but once sun is out past 45F/7C I had little bit of heat build issues. Still much better than me wearing 3mm wetsuit because I tend to overheat easily and sweat inside out! I still think I could done better on base layer choices so this year I have a new base layer to try out. Most challenging part of drysuit is what to wear underneath. Often we wear nice wicking cloth during the summer like my favorite “Virus” or other types of wool or synthetic cloth in the cold weather. 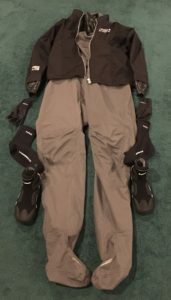 Last year I tried few base layer from my closet such as Patagonia, SmartWool and Virus. Quickly I learned that when you are in 100% sealed drysuit, the moisture build up is rather faster than Gortex fabric can breath out!. I was wet to my skin and I had to remove top base layer immediately from getting cold while driving back home. Last winter my choice was limited at the Quest Outdoors at the time I visited. Since I need it at that moment but in a process between my gloves and base layer I found these base layer to be well performed with a drysuit. No female version of this products from Mountain Hardware. I also tried one of my Polartech base base layer I already own but it didn’t wick well under the drysuit. 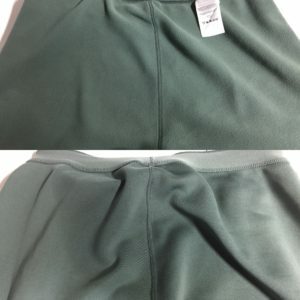 Mountain Hardware uses proprietary fabric not listed on website nor when I called they couldn’t tell me specifically what type of fabric it is. I did some research through google and I think I found the company in Europe fabricates this materials. I can assure you that that my skin is 100% dry after removing my drysuit and leaving only the wet/wicked on outer side of the baselayer. Drysuit needs quick wipe down each session but having your skin 100% dry is a life saving. Two of my collage photo shows how good the wicking performs from Mountain Hardware base layers. Few weeks ago I already picked up new base layer to try out. So this year I choose mid layer top and bottom to see if I can control my heat dissipation. This base layer is 50% merino wool/50% polyester. Eddie Bauer uses their own proprietary fabric called FreeDry® (moisture wicking pulls moisture to surface so skin feels drier). I had few T-shirts in the past worked well so giving it a try. Eddie Bauer’s First Ascent line is one of their premier line and performances is always been excellent. Obviously I have not tried yet but hoping to use test it out here very soon. Currently in Kentucky water temperature is 62F/16C and air temperature is roaming around in mid 40F/4.5C to mid 50F/10C. Always looking forward to be safe and comfortable during the winter training. 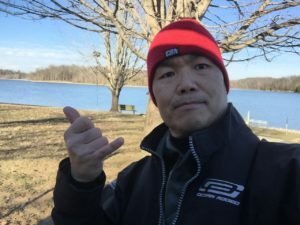 Before I go Lisa Schell shared a great article few weeks before Chattajack 31 about Air Temperature and Water Temperature safety. Be safe out there and keep paddling!!!! ← Keeping the hand warm this winter!